The following CNN iReport has not been vetted by CNN. iReports allow for users to post their own unedited media stories on CNN. We can only hope that the dangerous rhetoric from "so-called" conservatives that has been emanating from Washington, D.C. and news outlets like Fox News, begin to subside in wake of the tragic shootings that have taken place in Tucson, Arizona. From a CNN iReport — "A FaceBook Cause is posted. 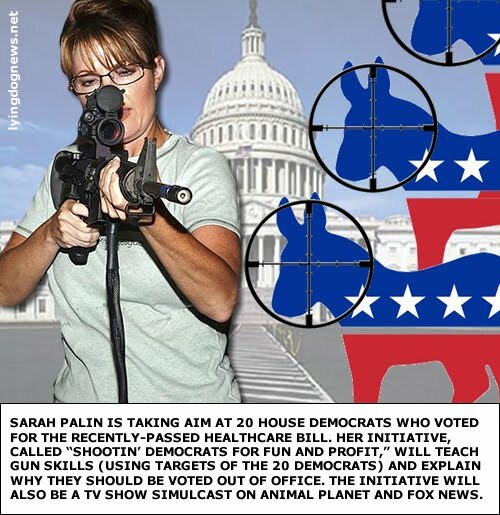 Charge and ARREST SARAH PALIN for Involuntary manslaughter by INCITING VIOLENCE against Gabrielle Giffons and all those injured in the Tuscon Massacre today. 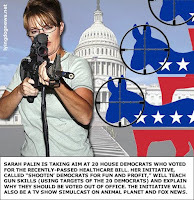 Twenty shots were fired, 5 dead, many wounded and Congresswoman Giffords in Critical Conditiion. Did Palin Plant The Seed in this mentally-ill man, Jared Lee Loughin? Some people think so!..."